Of all the programs in the Adobe CS3 software packages, Acrobat 8 Professional is the one that is the easiest to use if you want to just use it in its bare bones form, ie., standard PDF creation. Since I have been working with a friend of mine who is putting out a newspaper, I have used Acrobat 8 Professional a lot recently. He has Acrobat 7 Professional, and I find myself telling him to look for this or that only to find that it is not in Acrobat 7. A lot has been added to Acrobat 8 making it much easier to use and a much fuller package. 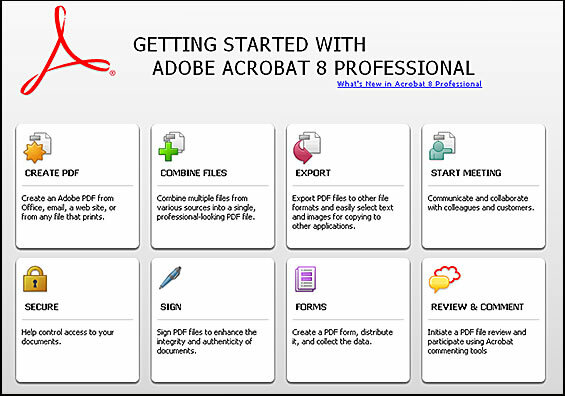 Some people might think that Acrobat 8 Professional is only necessary in a business environment, but if you are doing any work with sending documents, editing, commenting, etc. without it, I know I would be lost. 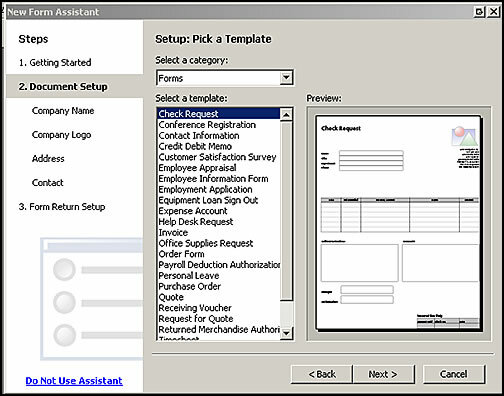 There are other Acrobat products with varying degrees of features. To look at the different features, click on "List." The list of new features is so long that I'll just touch on a few. Acrobat 8 was released earlier this year before the release of any of the Adobe CS3 packages. As I stated in the beginning, working with Acrobat 8 (I am only using the Professional version) is easy, especially if you are new to it. The Splash screen starts you off. I clicked on "Create PDF" and another help screen opened up. You can customize the work space in a number of ways. 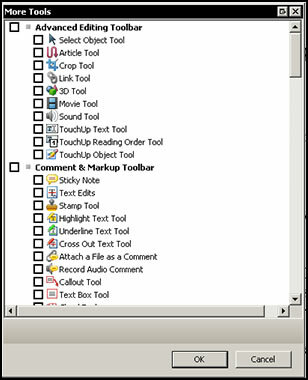 One of these is to choose what tools you want on the various toolbars. A number of the drop down menus from the top toolbar have been changed. The Advanced menu has been rearranged. 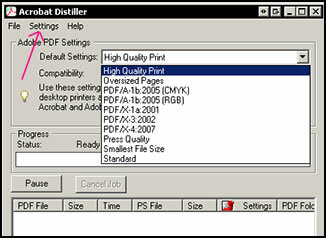 Acrobat Distiller, for example, is now under Print Production. Searching has been augmented and is now more robust. 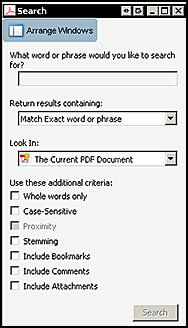 I find I use this feature often when I want to make sure that I have included information in a PDF or in a group of PDFs. A number of new features have been added or enhanced that deal with Microsoft programs and Lotus Notes. Now you can do more with PowerPoint and Excel, Mail merge to PDF within Word, convert email messages or complete folders to PDF from Outlook or Lotus Notes, etc. While going through some of the new or enhanced features, I thought I would play with the Headers and Footers option which allows for these to be displayed on documents. The page has been redesigned allowing for headers and footers to be set up simultaneously. Other changes to increase the workflow have also been added. They work great on all documents but html documents which is not surprising. However, I thought I would add a little note here about html documents. Have you ever been bothered about the fact that at the bottom of the page is the path of the document and at the top left is the name of the document? These annoying automatically generated headers and footers can be removed. I found this great information in the Acrobat forum on the Adobe site. Go to File>CreatePDF>From Web Page. A menu will open. Select HTML file, click settings, and uncheck "Place headers and footers on new page." It will remove the headers and footers that are automatically generated. Now, I thought that if I, then, added my own headers and footers from Document>Header and Footer, they would go in the same place as the ones that had been automatically generated. They did on the first page, but on the subsequent pages the text was moved higher up on the page, and they were overlayed on the text. The trick is to change the settings of the top and bottom before you create the new document by changing the settings using the same menu you did when you unchecked the URL information. This time, however, you choose "Page Layout." 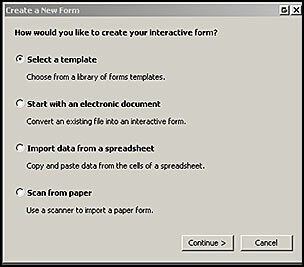 In Acrobat 8, creating forms is very easy. Go to top toolbar and select Forms. Then, start opening menus. You will notice the number of choices available. For those not familiar with Acrobat, the ability to comment and edit comments, stamp different notations such as "Approved," copy and paste an image, etc. is wonderful. You can just pass around one document from person to person or setup a shared review using the Setup Wizard. 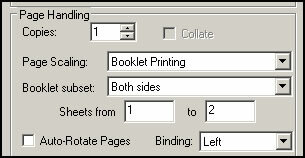 Printing a booklet is new in Acrobat 8. I needed to print a booklet. I set it up in InDesign CS3 and chose Print Booklet which brought up Acrobat 8. 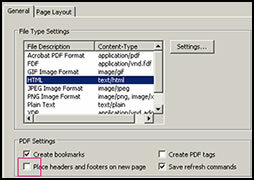 When not using InDesign, I would access it through the Print command. File>Print. Also, notice the other booklet options. I usually send documents across the web. Recently, I have been working with a friend and needing to produce PDFs for print. While these are not new tools in Acrobat 8, they are screens that I have been using a lot as I switch between creating documents strictly for the web or for print. On the top toolbar, go to: Advanced>Print production>Acrobat Distiller. Then, you can see and edit the settings. 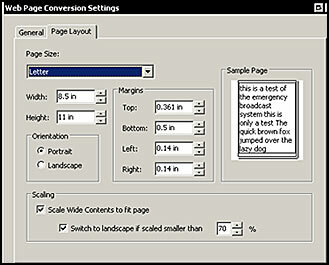 Another screen that is important is the PDF Optimizer. Again, go to the top toolbar: Advanced>PDF Optimizer. What I have tried to present in this review are some of the new and enhanced features of Acrobat 8 Professional as well as a general look at what Acrobat 8 Professional can do. There are so many ways to modify the choices in how to produce PDFs as well as how to use them once produced, that to a new user, it can become overwhelming unless one wants to just use it automatically. The latter choice is not really the way to go although it is easy to think "all I want to do is produce a PDF." However, how well the PDF will ultimately look is actually up to the user. There is a lot to Acrobat 8 Professional, and I have just touched on the bare surface of it. InDesign CS3 has a special relationship to Acrobat 8. Not only can you print PDFs directly from it and create booklets, but Acrobat 8 has the capability to use the JDF-based workflow by integrating with InDesign CS3. Starting with Acrobat 7 and InDesign CS2, Adobe introduced JDF (Job Definition Forms) based workflow. The idea is to create for a service bureau an entire project in one "package." Or one can create a template if one is going to create many different projects all having the same attributes. The interaction between the two programs worked flawlessly. The cost of a full version of Acrobat 8 Professional is from US $499.00 and for an upgrade is from US $159.00. You can upgrade from both Professional and Standard versions. You can download a free trial from this Adobe website. Once again, download a trial and, then, decide if upgrading is right for you. If you do not own a copy of any version of Acrobat, then definitely consider buying one. I could not get along without it.